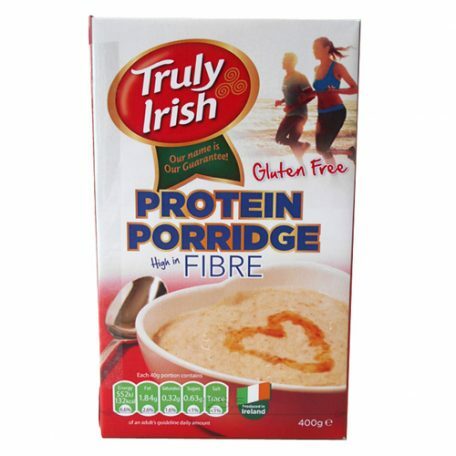 Included are 6 x 400g packets of Truly Irish Gluten Free Protein Porridge. As registered with the coeliac society of Ireland we can guarantee that our porridge has less than 20 parts per million (ppm) gluten content making it a safe choice for those who suffer from coeliac disease or gluten intolerance. Our porridge has added milk protein containing whey and casein for optimal nutrition, 18.9g of protein per 100g. 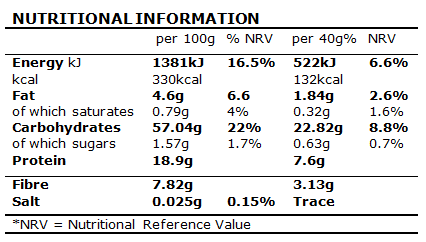 Low in sugar, only 1.57g of sugar per 100g. 100% wholegrain Irish gluten free OATS (92%), MILK PROTEIN (whey and casein) concentrate (8%). For allergens see ingredients in bold. May contain traces of nuts and sesame seeds. If you have reason to complain about this product, please return the packet and its contents to the Customer Service Manager at Truly Irish stating where it was purchased. Alternatively email your query to: info@trulyirish.com This does not affect your statutory rights. Produced in Ireland for Truly Irish Country Foods Ltd., Newcastle West, Co. Limerick, Ireland.